Been a really long time since I last blogged, pardon the absence! Managed to sneak some time amidst all the overtime (work) to blog this simple and delicious cake! This is a bake that you most likely won’t find in cafés – purely because it doesn’t look as pretty as those that are frosted or as dainty as those little tarts in display. 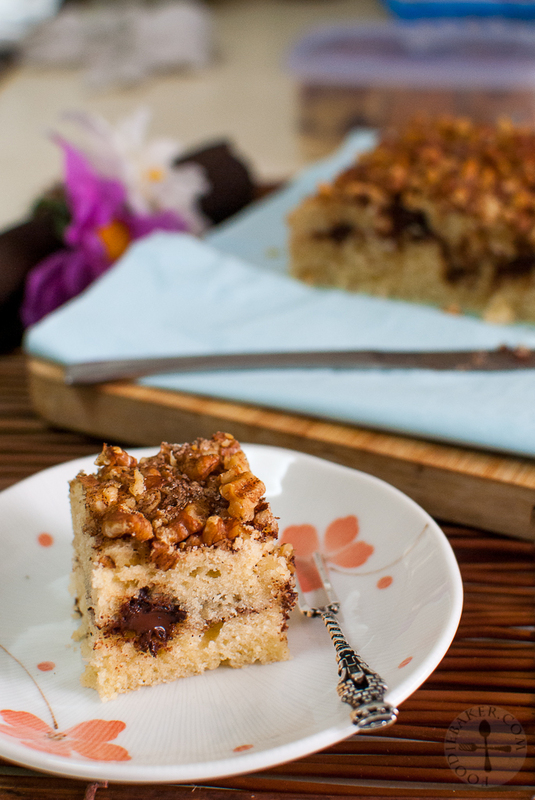 It is a sad thing because this cake is so delicious and so good with a cup of tea or coffee! The cake has a light and tender butter cake base – the lightness allowed me to finish a huge slice of this with ease and can still crave for more. Cinnamon sugar and oozy chocolate bits can be found in the middle of the cake – who doesn’t like chocolate? 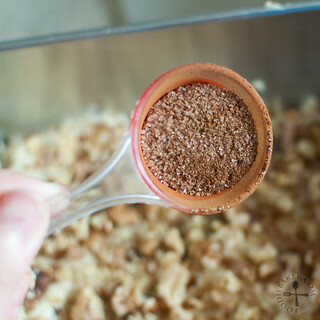 To finish it off, toasted, chopped walnuts and cinnamon sugar (again!) 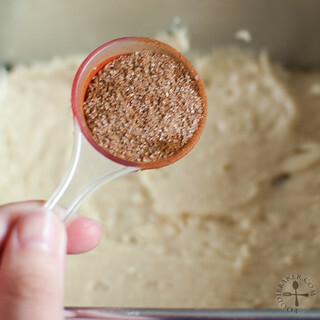 are sprinkled on top of the batter before baking. 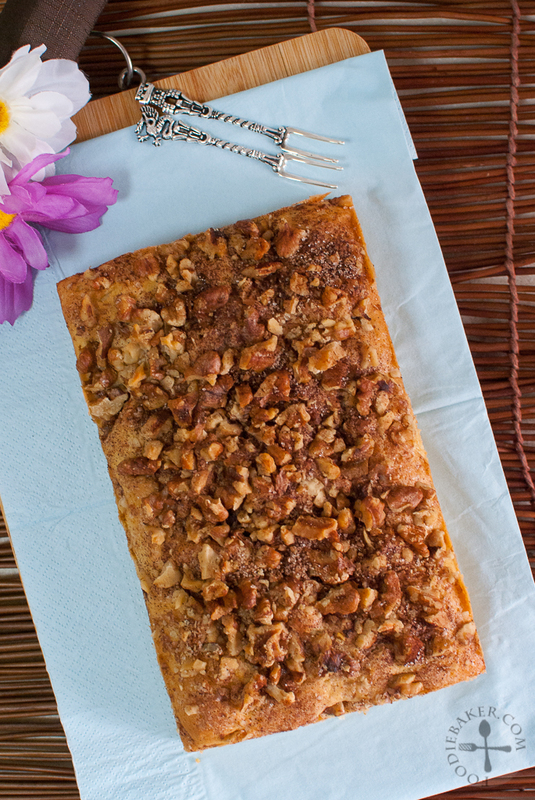 This gives a crunch and extra cinnamon-y goodness in every tender bite of the cake. A huge thanks to Eileen of One Hundred Eighty Degrees who chose this bake for The Home Bakers! Let’s head to the step-by-step photos! 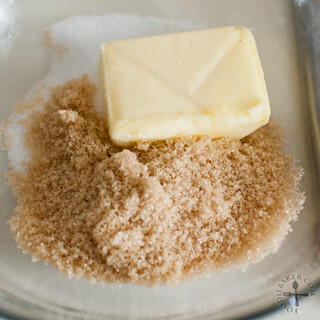 1) Cream butter and brown sugar together. 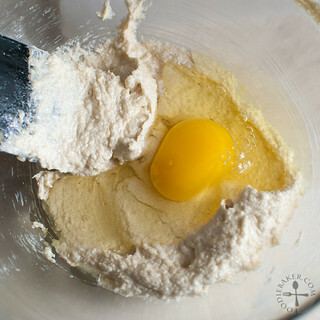 2) Add in egg and vanilla. 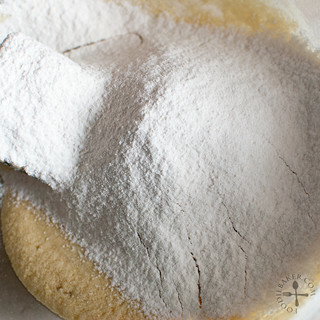 3) Stir in half the flour mixture. 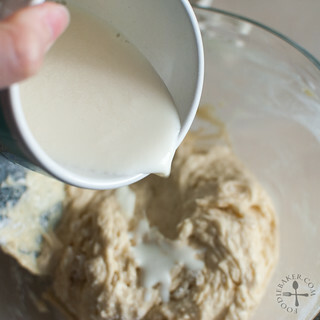 4) Stir in the buttermilk. 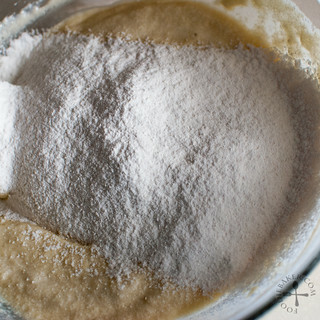 5) Stir in the remaining flour mixture. 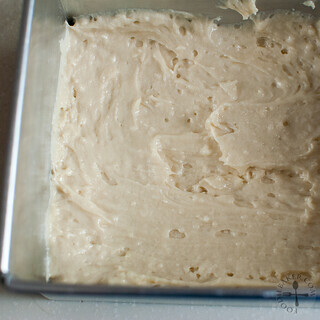 6) Spread half the batter in a greased and lined tin. 7) Sprinkle some cinnamon sugar. 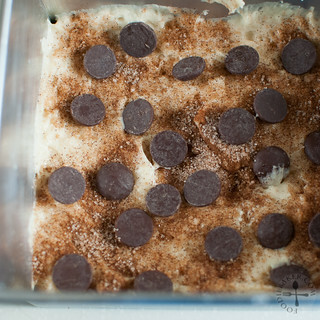 8) Add a handful of chocolate chips. 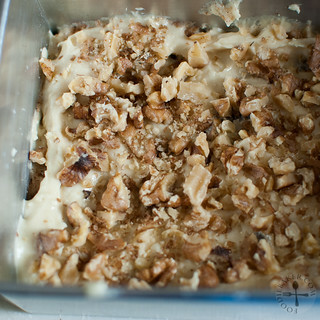 9) Spread the batter then add the walnuts. 10) Sprinkle more cinnamon sugar and bake away! 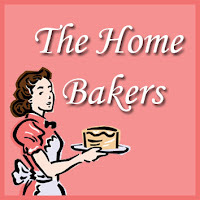 This is for The Home Bakers #30 hosted by Eileen of One Hundred Eighty Degrees. Thank you for the delicious cake, Eileen! See all the submissions here! Baking Note: I made 1/2 of the recipe and bake the cake in a 8×5-inch tin. 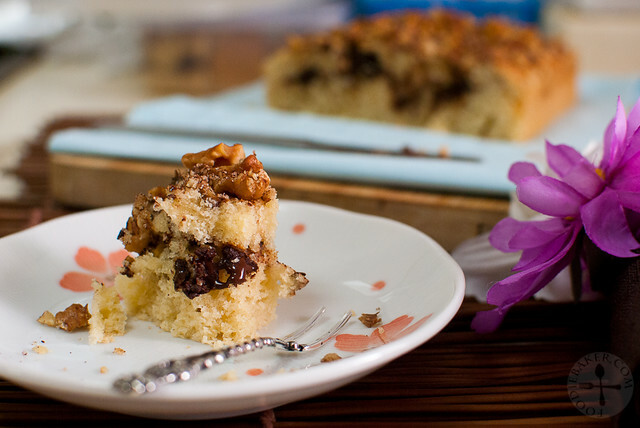 It makes a pretty short cake and the batter will seem like it’s not enough, but the cake will puff up during baking, encasing the chocolate chips, cinnamon sugar and walnuts altogether. Chopped bar chocolate can also be used in place of chocolate chips. Please head over to Eileen’s blog for the steps! what type of vinegar? can I asked? Sit down, relax and enjoy this with something hot to drink. Perfection. Jasline , just passing by to grab a slice, okay , If I can have the whole cake , so much the better lol I love the melty chocolate in the middle of the cake , heck , the cake itself looks wonderful ! Happy Chinese New Year ! May the Year of the Horse bring you and your family good health , happiness and good fortune !!!!! I enjoyed this cake very much too! It was delicious! Wow that turned out really well, what a nice cake! Hi! 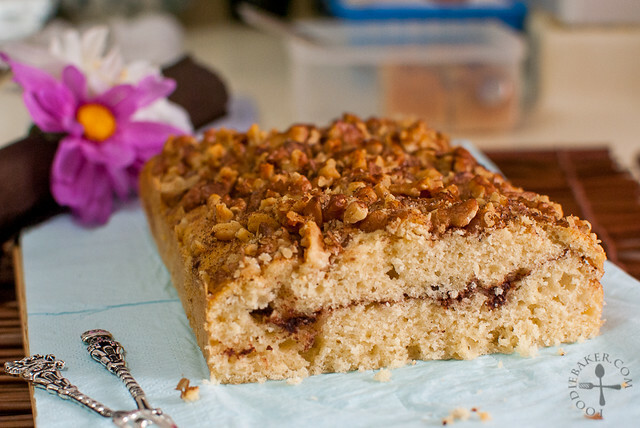 I think I will like this cake too, as I love cinnamon, makes the kitchen smell so nice! Looks lovely! Wonderful pictures and Fab results! This is one delicious cake! The perfect cake with a cuppa tea or coffee! What a tasty, sweet way to eat breakfast!